Can you feed yourself for $2/day? From May 16th to 20th several thousand people in Australia will be trying to see if they can get by on $2 a day. For students it shouldn’t be too difficult as we are often on the financial fringes of society. 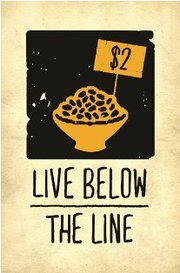 Sign up with Live Below The Line! i’ll be signing up and following from a distance as a distance ed student. This should be interesting. You’ll have to forgo those ridiculously expensive cups of joe at “Fivebucks”. Have fun. It is the week of the Wesak Day (May 17), the date to commemorate the Buddha’s birth, enlightenment and parinibanna. this must be good karma then!